Just about every morning, before my son awakes, you will find me sitting on my sofa, coffee in hand, surfing the local home listings. I share Michigan properties that catch my eye on our Facebook page - MidModMich, and Midwest listings that are outside of Michigan on the Facebook group I assist with, Mid-Century Modern Real Estate, World Wide. I will also share the stellar Michigan ones there, if Nancy, another contributor, asks me to. Thanks Nancy! The question of "How do you find properties?" has often been asked, so today I wanted to share HOW I look up mid-century modern & modest listings. And then on a separate search, because there are always so many of them, I search for "ranches"
I use 35-70 years old, which means I'm searching for homes built between 1944 and 1979. I realize this is a bit more broad, but I don't want to miss anything. Fireplace: If I have a few extra minutes, I'll do two separate searches for each set of types of homes. One WITH a fireplace, and the next WITHOUT a fireplace. County: When I search for "ranches" I will sometimes change the "county" to just Kent, Ottawa and Muskegon, since those are local to me, and usually there are so many ranches, it's hard to scroll through the list. And that's it - I put in those parameters and begin scrolling through the listings. There is a little photo of each home, usually of the front, and I can almost always tell if I'll like the inside. Yes, I'm totally judging a book by the cover in this case. Of course, the ranches are harder to judge - sometimes something from the outside will look kinda lame, but then you pop inside, and there are tons of great details intact. 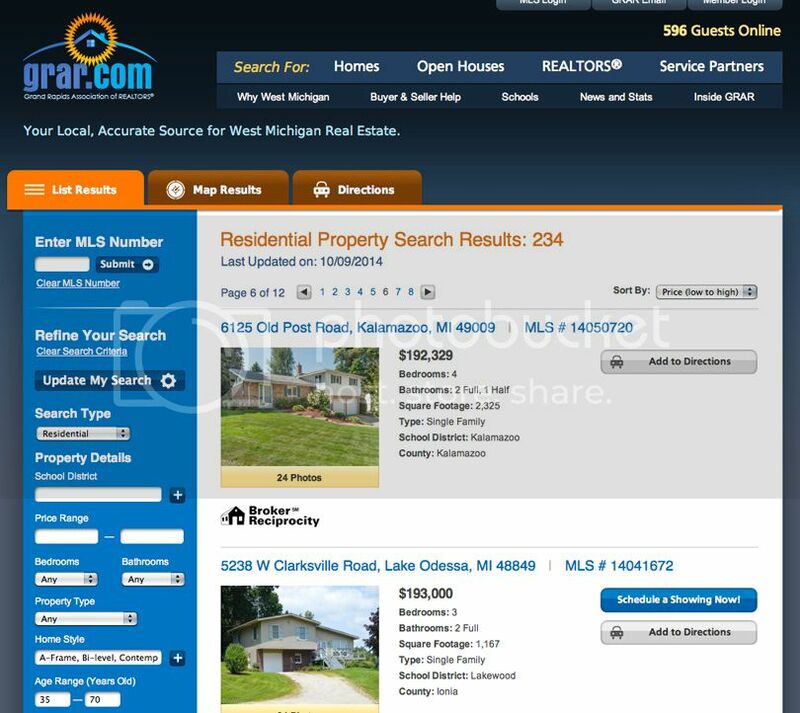 On Zillow, on which I use the iPad app, I do some similar searches, but also put "mid century" in the filter. The great ones that have been well-designed include this adjective, but most of the times they do NOT have this in the description, so it's just searching and searching. Good luck on your searching! If you're local, follow me on the MidModMich Facebook page, and for nationwide listings by other mid-century enthusiasts like myself, check out the Mid-Century Modern Real Estate, World Wide page.